Veterans Day approaches and cities throughout the Inland Empire begin to prepare for the ceremonies. Yet, for some, the respect shown to veterans during the celebrations cannot heal the wounds inflicted on them by their own countrymen upon their arrival home. Every year for Veterans Day and Memorial Day weekends, volunteers show up and hand out the ‘Buddy Poppy,’ across the country at grocery stores, department stores, and other local markets. In return, some give small donations to support veteran causes. These people are the members of the Veterans of Foreign Wars. This tradition goes back to just after World War 1. ‘Buddy Poppies’ are the adopted memorial flower for the VFW. They are assembled by disabled veterans and then handed out by volunteers. “We do poppies in front of our local grocery store, and people all stop, give you hugs, thank you for your service,” says Mike Bazylak; a Vietnam veteran and Commander of VFW post 9415, in Phelan. 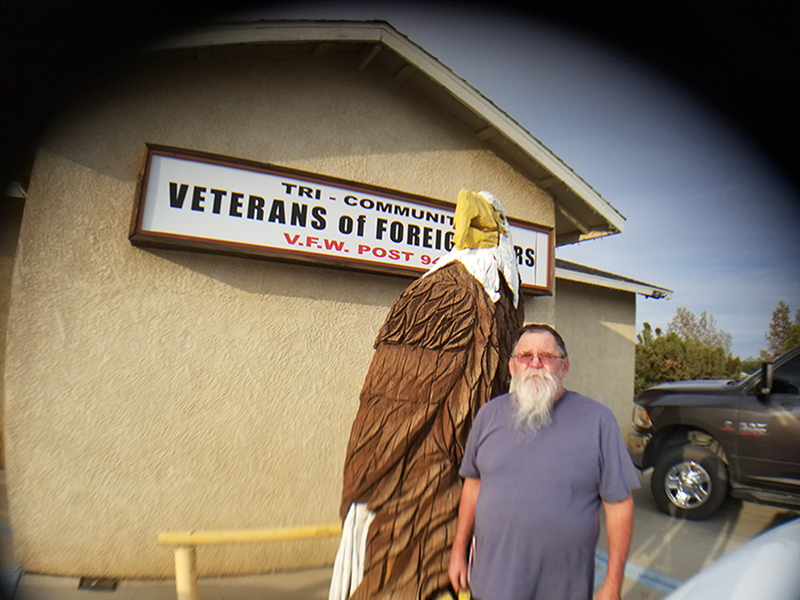 Gunther Steinberger standing outside the Phelan, VFW, preparing for his daily duties. On Sunday, November 11, the city of San Bernardino, is hosting a parade in honor of all veterans. On Monday, November 12, the city of Victorville, is holding a Veterans Day parade ceremony; and that’s just a few of the Veterans Day events going on locally. For Veterans Day, the Phelan, VFW holds a flag retirement ceremony that is performed by a local boy scout troop every year. Afterwards, a potluck is held inside the club. This year, a bugler will join the ceremony and play ‘taps,’ a song normally played during ceremonies and funerals. This event is open to the public, and is usually well supported by the local community. With all this love being shown to veterans on this most venerable of days, how do they truly feel about the holiday? Ted Davis is a Vietnam veteran, and Chaplain at this post. He is looking forward to this years events. While that is the general sentiment throughout this VFW post, for some members, the day is blemished due to the treatment that Vietnam veterans received after coming back from war. Jan Bazylak is not a veteran, but she is the Charter President for VFW post 9415’s auxiliary, its Senior Vice, and she is also the wife of Mike Bazylak. She is not the only person to recall this happening. The Vietnam War was an extremely divisive period for the country. It was even more so for those that fought, and for those that were drafted and came back to an ungrateful country. The Veterans of Foreign Wars is a non-profit organization that is made up of veterans, and that fights for programs beneficial to veterans. Membership in this organization currently stands at around 1.7 million according to its website. Thanks to organizations like this, Gunther Steinberger believes things have gotten better for veterans since Vietnam. Daniel Gonzales is a future veteran as a US National Guard member, and this is what he thinks Veterans Day means to veterans. As Commander of the post, Mike Bazylak wants the public to know this about Veterans Day.